"InformationWeek is a valuable resource which keeps us informed about trends, concerns, and the competitive landscape of IT. To be ranked in the InformationWeek 500 is truly an honor." "All of us at Zynga are honored to be named to the InformationWeek 500. We take a unique approach to IT, and this recognition is a testament to the innovation and commitment to all of the integrated teams that make up what we call 'global foundational services': our zCloud team, security, player advocacy, and service and traditional IT. At Zynga, our mission is to connect the world through games, and this team serves as the foundation to the millions of players that play our games each day." "Our team is honored to receive an InformationWeek 500 Top 10 award for the second year in a row. Being recognized for our work by a top-tier professional publication like InformationWeek is an affirmation that we are making meaningful contributions to the Vail Resorts customer experience through the innovative use of technology. We couldn't be more thrilled to be receiving this award on the same stage as some of the most talented IT teams anywhere." "At Cigna we are focused on improving the health, wellness, and sense of security of the customers we serve around the world. As global CIO, my goal is to better apply technology to create a better healthcare system with improved outcomes. To do so, we are leveraging our capabilities to be more consumer-centric. By recognizing that each customer is a unique individual with their own preferences, likes, and cultural orientation, and providing actionable information, how and when they want it, we enable each individual to improve their health, their health costs, and ultimately their quality of life." "UPS is honored to win the InformationWeek 500 Business Innovation Award in the Technology-Enabled Product category. We have seen through the eyes of our customers how UPS My Choice demonstrates product innovation. This is a true example of how UPS leverages advanced technology to offer a level of enhanced self-services to consumers unmatched in our industry-all while reducing UPS's overall operating costs." "I am incredibly honored and proud that Allstate is a part of this prestigious list. Our customers and agents are at the core of everything we do in technology, and this recognition represents our employees' dedication, focus on flawless execution, and quest for innovative solutions." "We often look to the InformationWeek 500 to see what great companies and organizations are doing. To make the list alongside these companies is an honor and confirmation of our team's efforts to be pioneers in the transportation and logistics industry." "Our company continues to get better and better at goal alignment, collaboration, and teamwork. Without the cooperation of many people in the company, our information technology efforts could not possibly be successful. So it is gratifying to see the hard work and team effort of all MGI employees around the globe being recognized. We are very proud to be included in the InformationWeek 500." "The InformationWeek 500 is more than just a competition. It generates tremendous positive recognition for our efforts to innovate and bring new capabilities to our customers. At First Horizon, we view technology as a strategic business enabler. Bringing innovative solutions to the forefront with our business partners and taking them from concept to reality is truly rewarding. Our desire to make the InformationWeek 500 also helps keep our IT team pushing the envelope to drive forward creativity throughout the organization. Being compared against and ranked along with the greatest companies in the world is always exhilarating and challenging. Receiving recognition for our innovative work sends a positive message to our customers about our commitment to delivering the best products and services available in the industry. In a financial services environment that is very challenging with little positive press, recognition for innovative technology work motivates my team members and helps us continue to push hard to deliver a differentiated customer experience." "It's both an honor and tremendously exciting to make the InformationWeek 500 list. Innovation is one of our five core values at Sparrow. The InformationWeek 500 always includes some of the most innovative organizations in the world, and we are thrilled to be listed along with this group of experts. Our patients demand and deserve innovation in order for them to receive the best possible care and the highest level of service for an affordable cost. This recognition is a reflection of the steps we are consistently taking to deliver those standards of excellence." Experience highlights from the live conference, as well as exclusive content presented in a unique virtual environment, on Oct. 2. Learn more and register now. The InformationWeek 500 Conference offers unparalleled content, editorial vision and renowned keynotes from leading organizations across the globe. At this year's conference, executives from leading companies around the world gathered to discuss how their organizations are rewriting the old IT rulebook and at the same time accelerating business execution and growth. 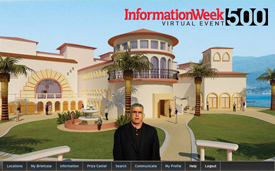 Experience highlights from the 2012 InformationWeek Conference, as well as exclusive content presented in a unique virtual environment, by registering for the InformationWeek 500 Virtual Event, to be held on October 2.